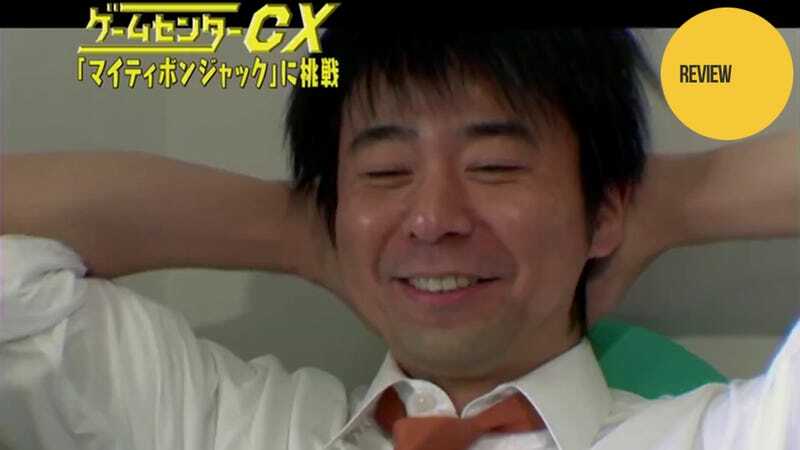 Game Center CX, (known as Retro Game Master in the West) follows Shinya Arino as he attempts to conquer classic games from the 8 and 16-bit eras. This past weekend marked the release of the series' first feature film. Though, given all of its problems, we'll be lucky if it’s also the last. The movie follows two parallel plots. The first is in the year 2006 and features Arino and his struggles to beat Mighty Bomb Jack. Honestly, I had never heard of the NES game Mighty Bomb Jack until I went to see this movie, but that hardly matters. It is obvious right from the start that Mighty Bomb Jack is one of those games that coined the term “Nintendo Hard.” Enemies spawn constantly and come right at you in different, random patterns so that it’s impossible to beat an area the exact same way twice. There is a “warp system” that gives you easier levels; but if you die, you return to the level at which you entered the warp. So while it is a game that seems to be unfair to the heights of absurdity, it also never seems completely unbeatable. Watching Arino spend several days of non-stop playing trying to beat this game was, for me, more than a little exciting as every time he tries, he gets just that much closer to the end of the game. It's hard not to be engrossed in his struggle to beat the game even as you see him once again lose all his carefully hoarded lives when on the brink of victory and have to start over. The other half of the story follows middle school boy Daisuke in 1986—and is a love letter to growing up otaku. Daisuke and his friends play Nintendo games on ancient CRT TVs and read gaming hint guides before heading off to the game store to see the Famicon Disk Writer as it copies new games onto Famicon disc drive discs. But more than just showcasing the gaming side of the 80s, the friends talk about other otaku staples like the Dragon Ball manga and Newtype Magazine. Daisuke even watches several classic anime over the course of the movie like Fist of the North Star and Touch. Seeing that roughly half of the movie is set in 1986 with a cast that is practically nothing but children, I was braced to endure terrible child acting. However, I was pleasantly surprised. For the most part, the children talk and act like children while still moving the plot along at an acceptable pace. Sure, there was a bit of hammy over-acting from time to time, but I expect that was more the director’s sense of humor than any mistakes on the actors' side. As exciting as Arino's fight to overcome Mighty Bomb Jack is, there are more than a few problems with this half of the movie. The main problem is that this is almost exclusively old footage from the Game Master CX TV series—complete with the narrator and words on the screen. You see, Mighty Bomb Jack was a three-part episode back in season six of the show (episodes 39-41). Basically, the film cuts those episodes down to about an hour run time. However, this is still footage from 2006 shot for TV; so despite them blowing it up for the big screen, it is still in 480p 4:3 SD. And frankly, on a movie screen, it looks absolutely awful. The problem with the 1986 half of the story isn't its visual quality (it was actually filmed with a widescreen movie camera at the standard 24 FPS). No, the problem with the 1986 portion is the plot. It’s frankly cliché to the point of being boring. Daisuke is a gamer otaku, and one day the pretty girl he has a crush on says she likes one specific game. As she describes it, he becomes certain it is Mighty Bomb Jack. He offers to let her borrow it; but before he can give it to her, the school bully takes it from him. Now he only has a few days before summer break starts to get the game to her. It all plays exactly as you'd think: Nerd has a few video game style fantasies and grows a backbone as he tries to get his game back. There is only one real surprise, and it's so weird, it gets its own section of this review. The film alternates between the 2006 and 1986 plots several times over its two-hour run. However, the two could not be more different in tone. One is a comedy reality show about a guy trying to beat a hard game. The other is a coming of age story about a boy trying to get his video game back from bullies so he can impress a girl. Other than the fact that the game is the same in both plotlines, there is absolutely nothing to connect the two stories in plot or in theme. The movie just seems to switch back and forth between the two plots at random. And then, at the climax, things get weird. After stealing his game back from the bullies, Daisuke hides inside a store and closes the security shutter. As he does so, he finds himself 20 years in the future, standing in a crowded hall watching Arino play Mighty Bomb Jack. He is called up on stage to try it himself but fails and returns to his seat. Over the course of this scene, the film switches from the HD film to SD archive footage in nearly every other shot, making for some schizophrenic visuals. But moreover, with regard to the story, the meeting of Daisuke and the Retro Game Master has absolutely no point. Daisuke doesn't help him beat the game and he doesn't help Daisuke sort out his bully problem. They just sit on a stage together for a minute and go their separate ways toward the resolution of their respective plotlines. Game Center CX The Movie is one part terrible movie and one part exciting TV episode. But while watching Arino play Mighty Bomb Jack is exciting, it's hardly new as you have been able to watch that struggle on DVD for half a decade. Daisuke's story, on the other hand, is useless and cliché; the only good to come out of it is the 80's gamer/otaku nostalgia that permeates the setting. Frankly, unless you are a diehard fan of the TV show, it’s probably not worth it to watch this movie. It’s better to just watch the Mighty Bomb Jack episodes on DVD. Game Center CX The Movie 1986: Mighty Bomb Jack was released in Japanese theaters on February 22, 2013. There is no word on a Western release.